Are you ever bored with your breakfast choices? If you are you must try this. Delicious. My granddaughter shared this recipe with me although I have slightly changed her version. 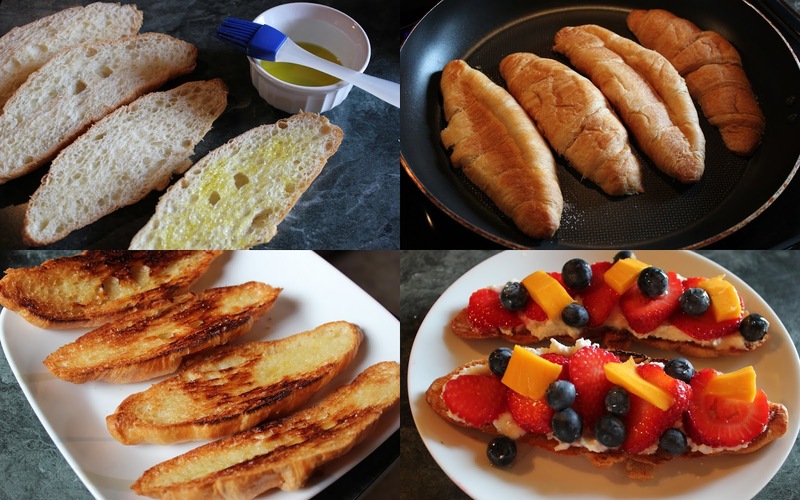 You could use the same method with different kinds of bread. Depending on how many you want to serve adjust recipe as needed. Cut croissants in half lengthwise and brush with olive oil. Sprinkle each half croissant with 1 teaspoon sugar. Place sugared side of croissants in a large skillet and cook over medium heat until golden in color and the sugar has caramelized. Remove and cool briefly. In a small bowl mix together ricotta, remaining 2 teaspoons sugar, and vanilla. Divide the mixture among the croissant halves spreading evenly. Pile on berries, drizzle with honey, and sprinkle with a bit of sea salt. Serve immediately. Just perfect. I can taste that crisp carmelized maple syrupy croissant with the lovely fruit juices. I can hardly wait for morning. Come to think of it, I won't! This is going to be my tea today. Oh why didn't someone post this before Mother's Day! I saw "honey" and immediately thought "maple syrup" because I am never without the 1 litre jug of the latter. Every time I empty one I get another. Sharon..no need to wait for Mother's Day. I've had this for breakfast a few times already. It's so delicious! Anonymous..oh my yes maple syrup would be so good on this too. Soooooo delicious!!! God bless pastry dishes and the hands that make them!